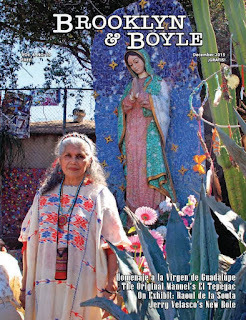 But back to our internalized external legacy from the hilltop known as Tepeyac, the upcoming December issue of Brooklyn & Boyle features a striking photograph of beloved East LA artist Ofelia Esparza standing in front of the statue of La Lupita that once stood vigil over the parking lot at the former Self Help Graphics location on Brooklyn Ave. (now Avenida Cesar E. Chavez) and Gage. The photo is by legendary photographer Oscar Castillo. It's ironic, because Castillo is the first Chicano photographer in history to have been given a one-man show in Tijuana as part of the Entijuanarte festival. Inaugurated over a year ago, the outdoor photographic exhibition, curated by Gregorio Luke, remains as a semi-permanent tribute to the Mexican American community in Los Angeles, and Tijuana is where writer Yépez made much of his stellar career. The final issue of 2015 also included the moving story of El Tepeyac Café. 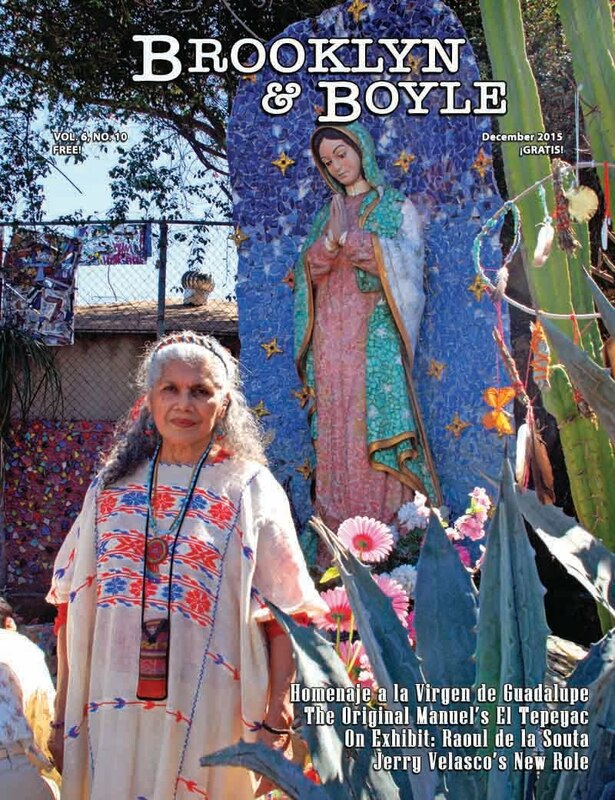 Unplanned, the story comes to us from the famed Boyle Heights restaurant and owner Elena Rojas, whose father Manuel was featured on our front page in 2013 upon his passing in a memorable portrait by Joel "Rage" García. Everyone talks about the mammoth-sized Manuel's Special Burrito and the requisite Hollenbeck Burrito there, but often we forget what really makes the place so special and what has endeared it to generations of loyal customers and friends. Ms. Rojas reminds us that true family is about more than just selling enchiladas and tacos to make a buck. We were also pleased to publish an interview with Glenna Avila, who like Isabel Rojas-Williams who was interviewed in the last issue, has done so much to advance the art of muralism in Los Angeles and yet remains largely unheralded outside of art circles and people associated with S.P.A.R.C. (Social & Public Art Resource Center) or CALARTS (California Institutes of the Arts). Brooklyn & Boyle invites you to support East Side arts and community news while promoting your business, service or organization with the purchase of a display ad within the pages of the smartest, coolest and classiest paper on the Greater East Side. Call us at 213-321-7115 to find out how you can be part of our tribute to the Virgencita in a special edition due out next week. Until then, And, as always, thank you for following us on Twitter/Instagram: @brooklynboyle or Facebook. We look forward to seeing you!